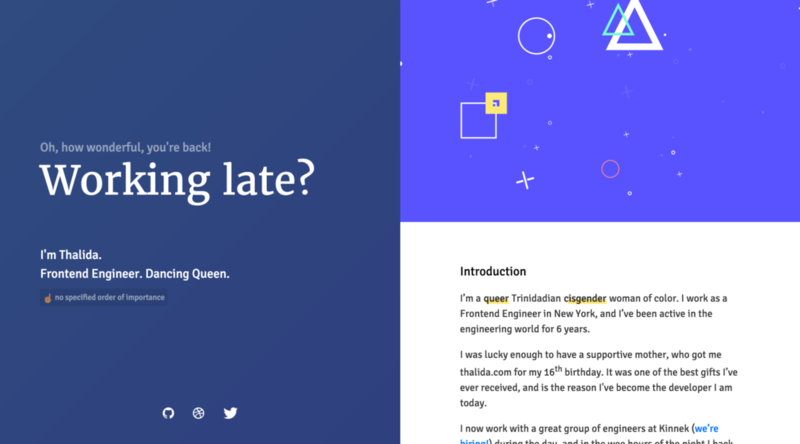 Centrally divided One Pager with tons of personality for front-end dev, Thalida Noel. Nice touch with the dynamic intro message based on the visitors time of day. Humbling to see Thalida sticking to the Singe Page format since we original featured her in 2008! thalida.com is my little baby of a site, I've had it since I was 16, and it's even been on One Page Love in the past with a (let's call it) unique brown theme. I use it as a test site to explore the newest and greatest, and this version lives up to that. In this newest iteration, it's evolved to be dynamic, with the left panel colors and text changing throughout the day based on the current time of the visitor. The right section, is where I've been exploring animations, cool ways of introducing concepts, and more. It's fully responsive, and works beautifully on mobile, tablet, and desktop devices.